With the publication of May’s monthly jobs report, unemployment in the US has fallen to 3.8%, the lowest it’s been since early 2000. A MarketWatch article in May said that “for the first time ever, there’s a job opening for every unemployed worker”. Organizations across the industry spectrum are scrambling to find the help they need. This is good news if you are a job seeker with the right skills and experience – and in the desired location – that make you a fit for the rising number of open jobs in the US. This rising tide of job openings isn’t benefiting everybody, though. 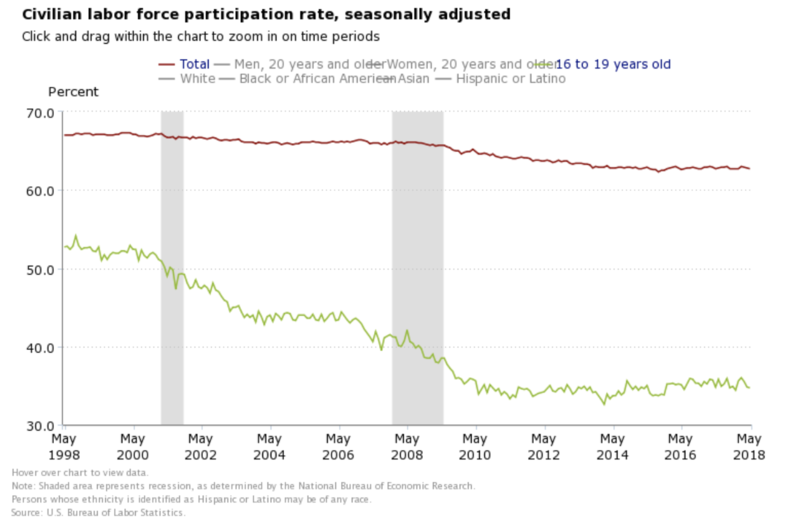 The Bureau of Labor Statistics below shows the labor force participation rate (LFPR) trend over the last 20 years. Applied to people 16-64 years old, the LFPR represents the sum of employed people plus unemployed people seeking a job divided by the civilian non-institutionalized population. You can see that this metric has declined overall (red line) in the last 20 years. This analysis from the Federal Reserve Bank of Atlanta cites a number of reasons why this is true – an aging workforce and their attendant health issues, discouraged workers who’ve given up looking, and the impact of the opioid crisis, among others. You can also see that this decline is much more pronounced among young people 16-19 years old. Certainly many in this age group are in school – but that would have been the same for this age group 20 years ago as well. Perhaps some of this decline is attributable to young people taking unpaid internships  to build their resumes. This cohort is likely earning college degrees and will enter paid employment as they earn those credentials. What’s also going on, though, is the growing population of “disconnected” or “opportunity” youth. According to Opportunity Nation, an advocacy organization focused on closing the opportunity gap for young people, there are over 5.5 million (1 in 7 young adults aged 16-24) who are neither in school or employed. This ranges from a high of 17.4% of this age group in New Mexico to a low of 7.2% in New Hampshire. Clearly, these young people will need help to enter the job market. Organizations like UTEC and CHAP  connect entry level workers with training and job opportunities. Have a look at this story from the South Bend Tribune about how the public school system is adding a “Grade 13” program to boost the workplace readiness of student going directly from high school to work. According to the article “Companies say they can teach new workers the technical skills but that’s more difficult with “soft skills,” such as communication and reliability”. My first job was helping with administrative work at a fish processing plant. Full disclosure – my Dad was the boss. I had a foot on the ladder with no effort required on my part. My first job outside the family business was working in a hospital lab during college – where a coworker kindly told me that I never stopped whistling and singing to myself and that I needed to quiet down. Over the course of those first few jobs in my teens and early twenties, I learned how to be a productive member of a team as I was shaped by those jobs. We all have to learn what it takes to make it at work – from showing up on time, to how to dress, and how to navigate a relationship with supervisors and coworkers. That transition is never easy. What’s going on in your organization or your community to help disconnected youth take that first step?